Buses could operate like trams, but only if we find an alternative to drivers checking and selling tickets. 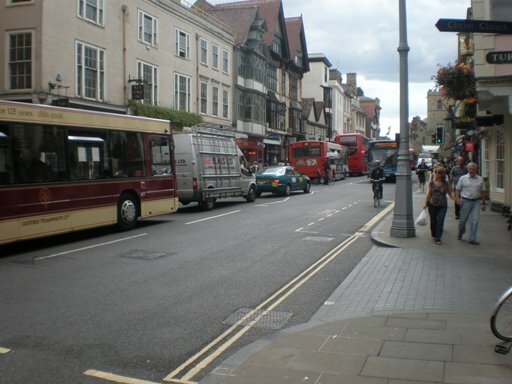 The simplest way to make an excellent bus network for Oxford would be to allow two-way bus operation in Queen Street. This is probably what would happen if Oxford had a tram system. There are similar situations in (for example) Basel and Freiburg, and the trams run straight through the city centre without causing too much of a problem. There are also cities like The Hague or Antwerp where the trams run under the main street. This is very expensive (hundreds of millions of pounds), and would be quite hard to justify. But what these cities have in common is that the trams go through the very heart of the city. So why are buses different? Why are they so horrible that we want to remove them from our city centres? It’s still rare for a bus to be fully-electric, but they are a lot less noisy and smelly than they used to be. Well-driven hybrids, in particular, are hardly a problem at all, when moving. The main difference is the amount of time buses are stopped, to let people get on and off. The occasional bus isn’t a problem, but in a busy city centre you can quickly end up with a wall of buses, destroying the pedestrian feel of the street. The length of time for the stop is the result of selling and checking tickets. At peak times, it can take five minutes to take on a full load. At less-busy times, two minutes is quite normal. By contrast, a typical tram stop takes between 15 and 30 seconds. The usual system for checking tickets on trams is to have random inspections. These are never frequent enough to stop widespread fare-dodging, with 25% or more of people travelling without tickets. Clearly it is fairer if everybody pays. 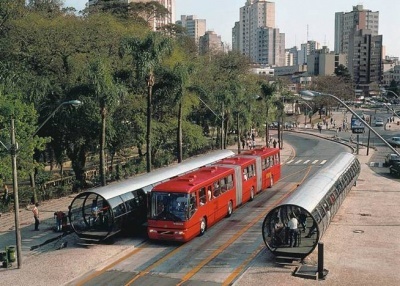 The solution adopted for bus rapid transit in South America has been to create gated stations at the all the bus stops. A simpler version of this could be considered for Oxford. This would start by having someone to sell tickets at the busiest bus stops at the busiest times, then maybe a couple of people to check tickets, so the rear doors can be used for boarding. It would help if all buses had rear doors. Even so, it wouldn’t be possible to load a full double-decker in less than a minute. The best option then is to split the boarding between two stops, say at Bonn Square and Carfax. 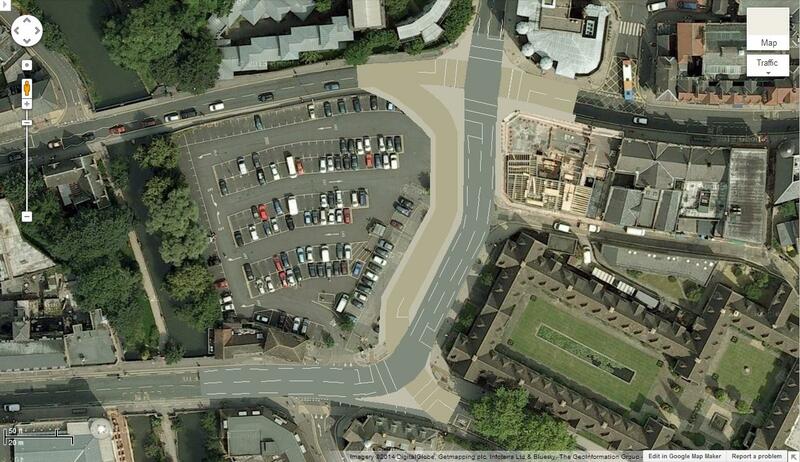 Buses would stop at Bonn Square to pick up half a load, then at Carfax to pick up the remainder. This gives more places to catch the bus, and keeps the impact at any location to a minimum. A possible alternative would be to have two stop-positions at one stop. But for this to work efficiently, the buses would need to run in pairs (eg by despatching them in pairs from the railway station). I think if we seriously focus on improving dwell times, and have multiple credible stops in the city centre, we can run the buses much more like trams, so they have much less impact on the pedestrian environment. The best arrangement is to run most services from the east through Queen Street (two-way) to the railway station. 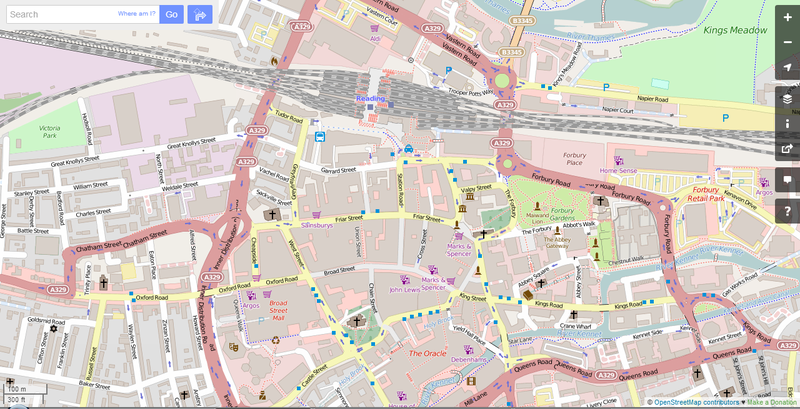 A few services (mostly the coaches) would still use St Aldates, but there would be many fewer stops (none at the top end), and the pavements could be much wider. Buses from the south would generally run via the new Westgate development and Castle Street to the station. Similarly, buses from the north would run through George Street to the station, reducing the amount of space needed in Magdalen Street, and providing easy interchange with other services. There are a large and growing number of people commuting by car into Oxford from beyond the city fringe (the big red 19000 arrow in the diagram below). We haven’t provided public transport of sufficient attractiveness to get people out of their cars. The consequence has been severe congestion on the outskirts of Oxford, on Botley Road and Abingdon Road, and around the hospital. 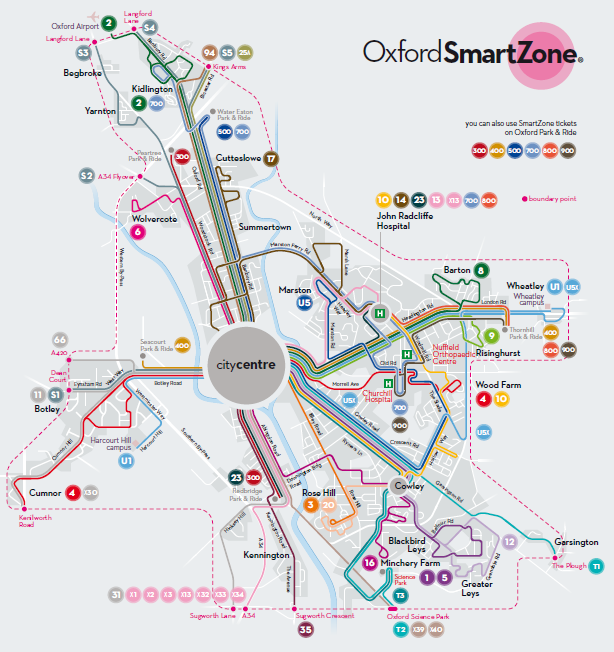 Oxford has successfully used bus lanes on several corridors to give buses priority. 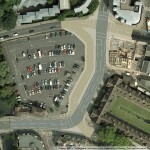 The closure of the High Street to through traffic in 1999 had a similar effect, making the cars go the long way round. Coupled with parking restrictions, and cycling and walking, this has been very successful in reducing car use within the city, especially to the city centre – where the car modal split is 10%. There are two other major centres of employment in the suburbs: Headington and Cowley. The main employers in Headington are the hospitals and the universities, and they have only been allowed to develop on condition that they limit parking. This has been reasonably successful, mostly as a result of people walking and cycling from within the city. In Cowley, the major employment site is the car works, and the business park that was developed on part of it, both next to the ring road. There is little parking restraint, though a fair number of people walk and cycle. Some of these drivers will be using Park&Ride, but there are only about 4000 spaces available, and they have to be shared with drivers from the fringe, and from further afield. People driving to the Park&Ride are also contributing to the congestion on the outskirts of the city. We need a significant increase in the number of people using public transport from further away. 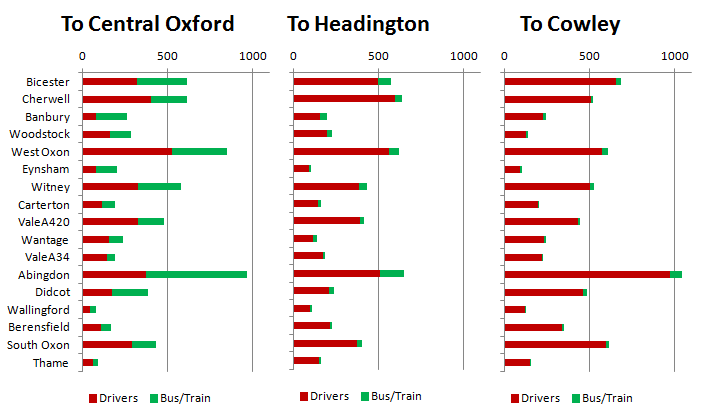 The first chart shows where people are commuting to central Oxford from the rest of Oxfordshire, beyond the city fringe. The origins are in rough order, going anti-clockwise around the city, with the principal towns separated out (Cherwell, West Oxon, ValeA420, ValeA34 and South Oxon cover the remainder). There are respectable levels of public transport use, particularly from Didcot and Banbury (half-hourly rail), Abingdon and Witney (buses every 10 minutes or better) and West Oxon (hourly train). But many still drive, despite the congestion: public transport is far from being dominant, though it is definitely a contender. The second chart shows the situation for Headington. While some people use conventional public transport, it’s mainly from Abingdon (there are three buses per hour direct from Abingdon to the main hospital, plus parking restrictions to support its use). The third chart, for Cowley, shows how public transport is almost irrelevant. So the best prospect for modal shift is still for city centre workers. The strategy is probably to try to crack the congestion issues for buses to the city centre, to really make public transport dominant. The prospects for public transport direct to Headington and Cowley don’t look very good – the market is too dispersed. Public transport works best when it focuses on key centres of demand, preferably all-day demand. So the only sensible strategy is to link the key employment sites to the public transport hub at the main railway station. While there has often been talk of reviving the railway line to Cowley, a bus service would be the starting point, probably running fast to Cowley Centre, then via Garsington Road to Blackbird Leys. This would give it an all-day market. 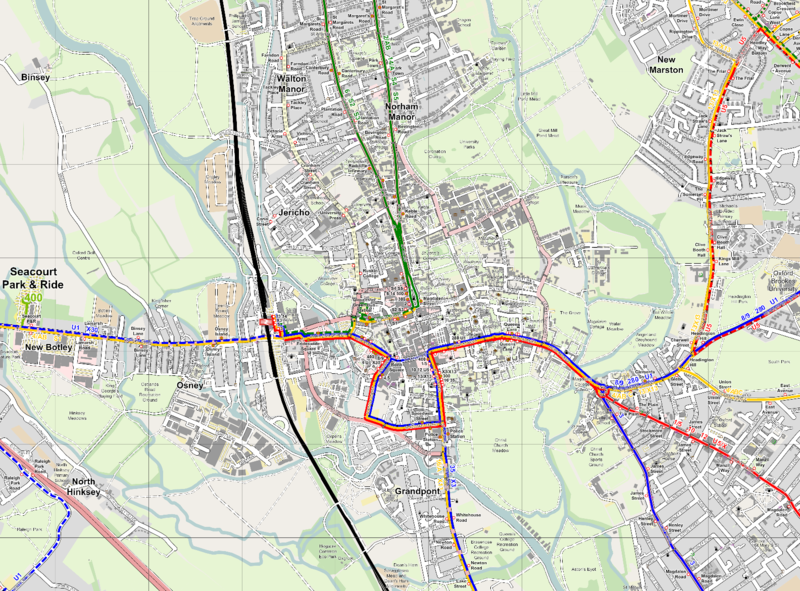 For Headington, a bus service along London Road almost to Headington shops, then into the hospital and on to Northway and Barton West might work better than the existing indirect service via Marston. But doesn’t this mean yet more buses in the city centre? Yes a few, though partly it is about rearranging existing services. The key problem with buses in the centre is boarding times, and that can probably be tackled by increasing use of smartcards and off-bus ticket purchase. By looking at where people currently travel by public transport, and where people drive, we can see where and how public transport is most likely to work. It takes a lot of people travelling for a variety of purposes throughout the day to make a successful public transport service. 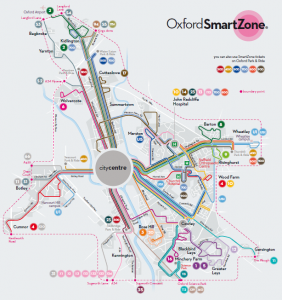 Oxford has an excellent bus system for a medium-sized city, and with a bit more traffic management, it can be adapted to work well for journeys from the rest of the County as well. 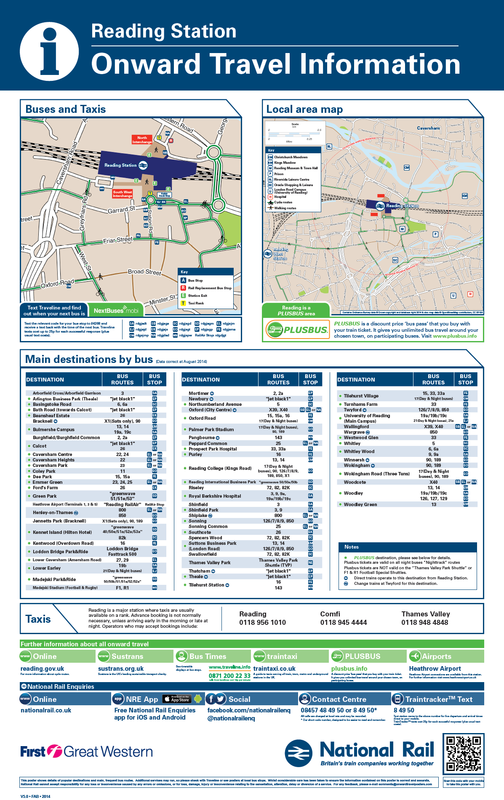 Oxford’s buses are excellent – for getting to the city centre. Based on the inner cordon counts, over 40% of journeys into central Oxford are by bus. Buses run at least every five minutes on all the main corridors. 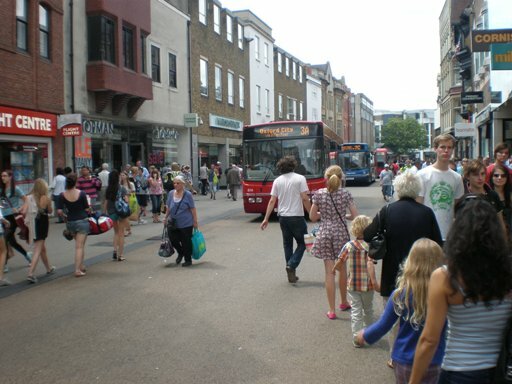 A large part of this success is due to bus priority, most notably the closure of the High Street to general traffic in 1999, blocking the only direct route from east Oxford. But all these high-frequency routes don’t add up to a network. 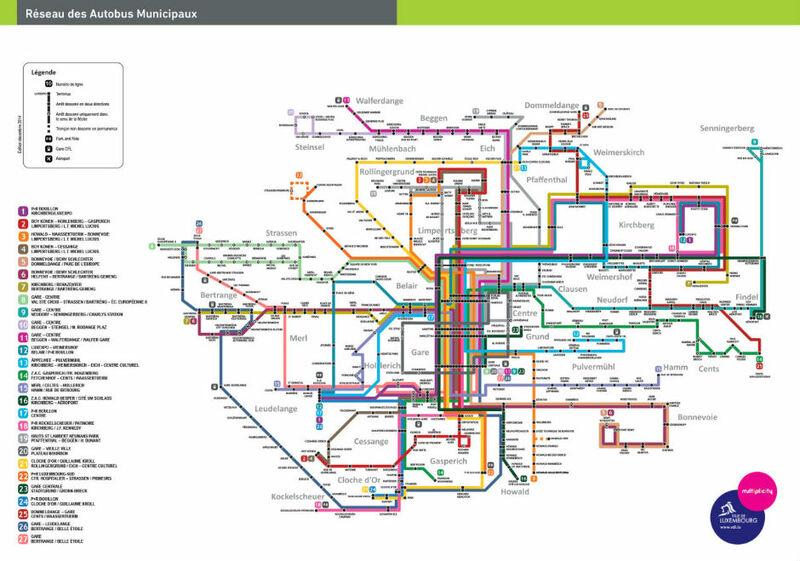 If we want a truly excellent public transport system, the individual routes need to connect – and the system needs to be clear and easy to use. At the moment, Oxford can’t really be said to have a joined-up network. 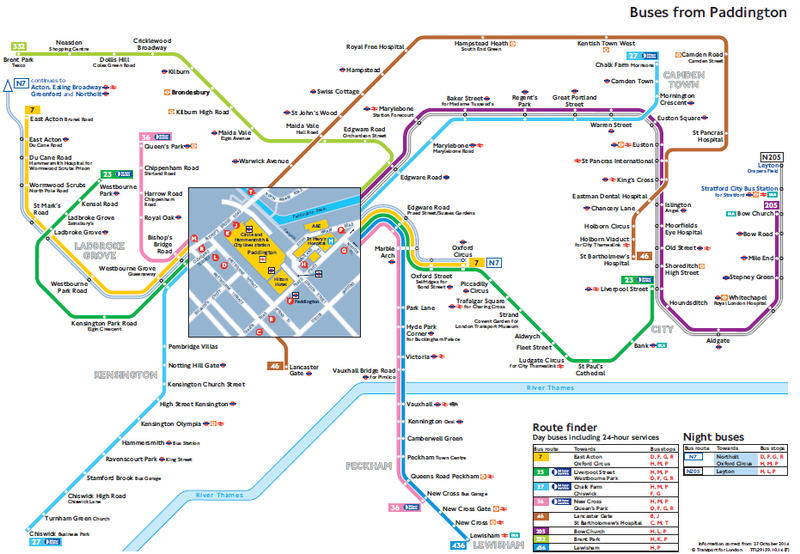 In fact, as is typical in the UK, the local bus map doesn’t show what happens in the city centre at all. There are particular reasons why the centre is too complicated to map. There are two major bus companies and several smaller ones. 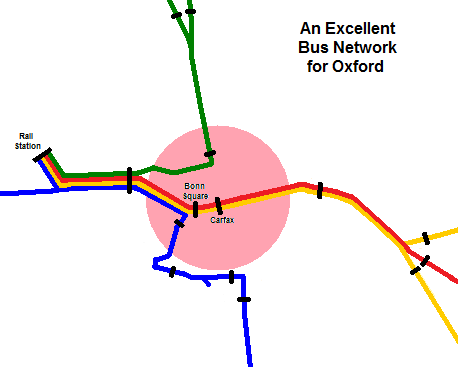 Bus services are profitable in Oxford, and this has led to competition and duplication. In the last few years, the two main companies have agreed joint operation of some of the busiest services, but there remains a huge variety of low-frequency services. 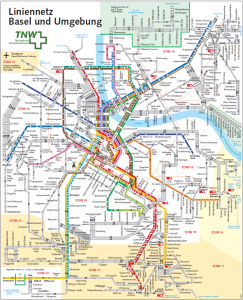 Despite some joint-ticketing, services are still designed around route-specific ticketing. In most of the rest of Europe, tickets are valid for a fixed time, so services can be designed for interchange. In the UK (outside London), there’s little coordination between services, even between services run by the same company, and pretty much everything runs into the city centre. Even if low-frequency services were excluded, the situation in the centre would still be too complicated. This is because the high-frequency services take a variety of routes through the centre, with some running through, some looping round, and some doing both. 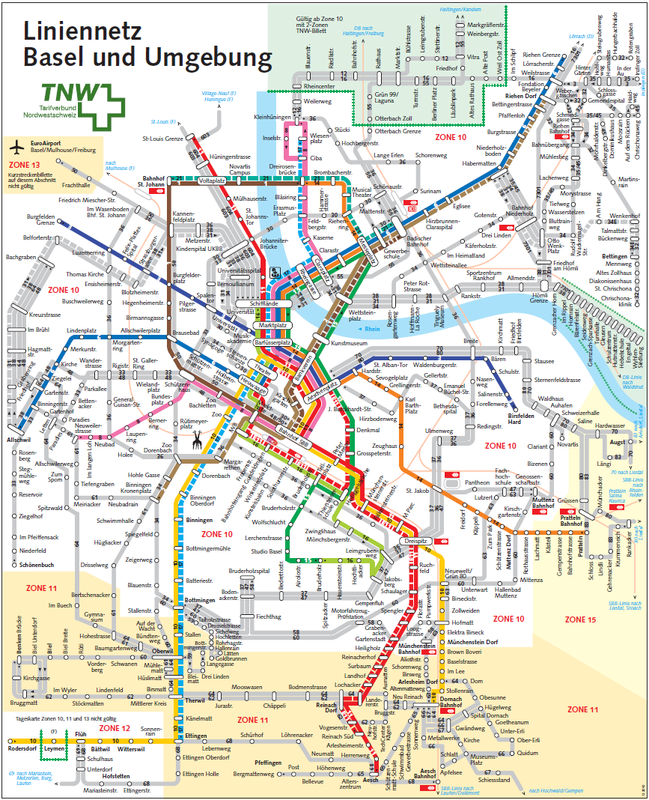 By comparison, in a Swiss city such as Basel, one-way loops are rare, almost all the routes run two-way, and most of the main services run through. 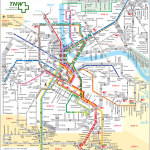 This pattern is partly the result of operating trams, but it also applies to cities such as Winterthur which operate buses. The lack of loops makes it much easier to create a network map. There are fewer lines, and interchanges are clear and simple. 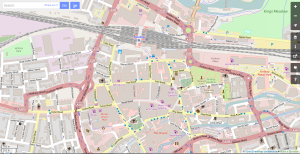 It’s easier to understand the services as a network, and the usage reflects that – it’s not just a service into the city centre, but the normal way of getting anywhere in the city. This is one of the key reasons why car use in Basel is remarkably low (under 20%). The Swiss even stick to two-way operation in quite narrow streets: they just run non-stop. As we’ve found in Queen Street in Oxford, buses have very little impact if they just run through a street slowly. Buses and trams only really get in the way when they stop. 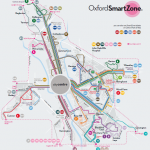 How can we make Oxford’s buses simpler for people to use, for a wider range of journeys? It would be great if we had trams instead of buses, but since buses are cheaper to run, it’s probably better to stick with what we have – fares are high enough already. But even without trams, we can make significant improvements, by learning from the Swiss. It’s difficult to run services through from one side of Oxford to the other, because demand is much higher on the eastern side, requiring bigger buses. So a lot of services do have to terminate. We also have to cope with fairly slow loading, with every passenger having to pay the driver or show a pass or ticket. This has led to a situation where each main service has its own stop, and stands there for several minutes loading. Through journeys are tediously slow, and interchange generally requires a walk across town. Some ticketing reform would certainly help. The central stops could have ticket machines, so the driver only has to check tickets. Tickets above a certain value could be valid for interchange between SmartZone services, for say 30 minutes. Smartcard ticketing could be extended to these 30-minute passes, rather than being limited to day (and longer) passes. But the real solution is to run the main eastern services two-way, non-stop through Queen Street, to the railway station. This will give those services multiple credible boarding stops, no reason to stand at any stop for very long, and facilitate interchange with other services. Only the main eastern services would run through Queen Street – the rest would turn down St Aldates and run through to the south, or terminate at Speedwell Street. Most southern services would run via Castle Street to the railway station, and northern services could run to the railway station as well. 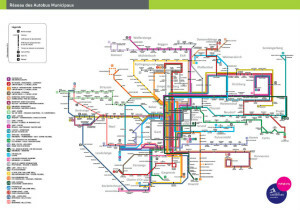 This would provide clear interchange between services, and allow a proper network map to be drawn. More space would be required for buses at the station, but that’s achievable by moving the taxis to the short-stay car-park. There would also need to be a clear bus priority route through Frideswide Square. That can be achieved by running the buses along Hythe Bridge Street, switching the general traffic to Park End Street, and crossing over at Worcester Street (a potential layout is shown below). Unfortunately, the latest proposals for Frideswide Square rely on crossing over at a sequence of three roundabouts, which is almost bound to gridlock in the evening peak. Two-way buses in Queen Street inevitably means compromising space for pedestrians. But if we want to have excellent public transport in Oxford, and get people out of their cars, we need to give the buses the space they need so they can operate as a network. 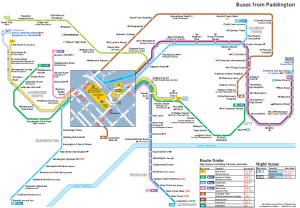 Maps from Oxford Bus Company (pdf), Basel On The Move (pdf), and Google Maps. Buses run through this pedestrian area, at very slow speed, but don’t stop. Pedestrians are able to use the whole space.